Junyi Ge, Zhengtang Guo, Deai Zhao, Ying Zhang, Tao Wang, LiangYi, Chenglong Deng, 2013. Spatial variations in paleowind direction during the last glacial period in North China reconstructed from variations in the anisotropy of magnetic susceptibility of loess deposits. Tectonophysics (in revision). Ge, J., Dai, Y., Zhang, Z., Zhao, D., Li, Q., Zhang, Y., Yi, L., Wu, H., Oldfield, F., Guo, Z., 2013. Major changes in East Asian climate in the mid-Pliocene: Triggered by the uplift of the Tibetan Plateau or global cooling? Journal of Asian Earth Sciences 69, 48-59. Yang Song, Qingzhen Hao, Junyi Ge, De'ai Zhao, Yan Zhang, Qin Li, Xinxin Zuo, Yanwu Lu, Pan Wang, 2013. Quantitative relationships between magnetic enhancement of modern soils and climatic variables over the Chinese Loess Plateau. Quaternary International, doi.org/10.1016/j.quaint.2013.12.010. Sun, L., Wang, Y., Liu, C., Zuo, T., Ge, J., Zhu, M., Jin, C., Deng, C., Zhu, R., 2013. Magnetochronological sequence of the Early Pleistocene Gigantopithecus faunas in Chongzuo, Guangxi, southern China. Quaternary International, doi.org/10.1016/j.quaint.2013.08.049. ZHANG Yan, GUO ZhengTang, DENG ChengLong, WU HaiBin, ZHANG ChunXia, GE JunYi, ZHAO DeAi, LI Qin, SONG Yang, ZHU RiXiang, 2013. The use of fire at Zhoukoudian: Evidence from magnetic susceptibility and color measurements. Chinese Science Bulletin (accepted). Haibin Wu, Zhengtang Guo, Joël Guiot, Christine Hatté, Changhui Peng, Yanyan Yu, Junyi Ge, Qin Li, Aizhi Sun, Deai Zhao, 2013. Elevation-induced climate change as a dominant factor causing the late Miocene C4 plant expansion in the Himalayan foreland. Global Change Biology (accepted). Chen, G.-Q., Yi, L., Xu, X.-Y., Yu, H.-J., Cao, J.-R., Su, Q., Yang, L.-H., Xu, Y.-H., Ge, J.-Y., Lai, Z.-P., 2013. Testing the standardized growth curve (SGC) to OSL dating coastal sediments from the south Bohai Sea, China. Geochronometria 40, 101-112. Ge, J.Y., Guo, Z.T., Zhan, T., Yao, Z.Q., Deng, C.L., Oldfield, F., 2012. Magnetostratigraphy of the Xihe loess-soil sequence and implication for late Neogene deformation of the West Qinling Mountains. Geophysical Journal International 189, 1399-1408. Ge, Junyi, 2012. 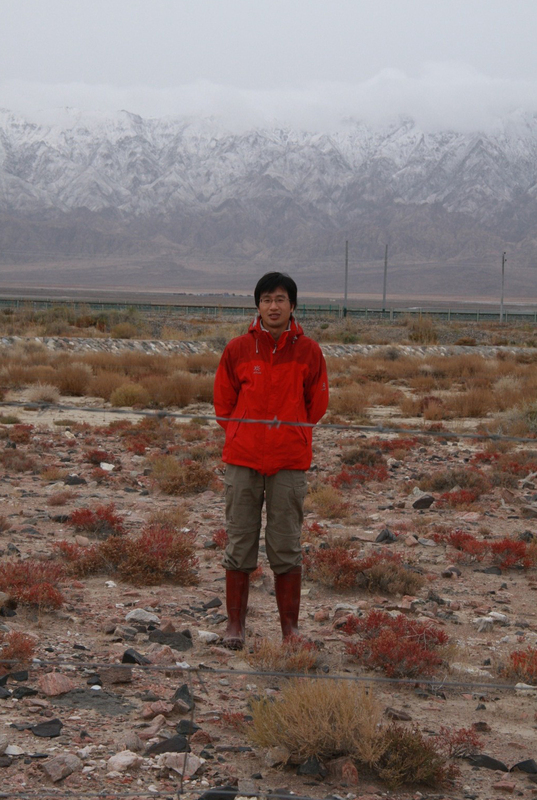 Magnetostratigraphy of the Xihe loess-soil sequence and implication for late Neogene uplift of the West Qinling Mountains. Quaternary International, 279-280: 163. Liang Yi, Hongjun Yu, Junyi Ge, Zhongping Lai, Xingyong Xu, Li Qin, Shuzhen Peng, 2012. Reconstructions of annual summer precipitation and temperature in north-central China since 1470 AD based on drought/flood index and tree-ring records. Climatic Change 110: 469-498. Liang Yi, Hong-Jun Yu, Joseph D. Ortiz, Xing-Yong Xu, Shen-Liang Chen, Jun-Yi Ge, Qing-Zhen Hao, Xuefa Shi, Shu-Zhen Peng, 2012. Late Quaternary linkage of sedimentary records to three astronomical rhythms and Asian monsoon, inferred from a coastal borehole in the south Bohai Sea, China. Palaeogeography, Palaeoclimatology, Palaeoecology 329-330: 101-117. Dai Ying, Zhang Yan, Ge Junyi, 2011. Decadal-scale variability of warm season temperature in Beijing over the past 2650 years. Chinese Science Bulletin 56, doi: 10.1007/s11434-011-4574-0. Tao Zhan, ZhengTang Guo, HaiBin Wu, JunYi Ge, Xin Zhou, ChunLin Wu, FangMing Zeng, 2011. Thick Miocene eolian deposits on the Huajialing Mountains: The geomorphic evolution of the western Loess Plateau. Science China- Earth Science 54(2):241-248. Junyi Ge, Zhengtang Guo, 2010. Neogene eolian deposits within the West Qinling Mountains: climate and tectonic implications. Chinese Science Bulletin 44: 1483-1487. Guo, Z.T., Ge, J.Y., Xiao, G.Q., Hao, Q.Z., Wu, H.B., Zhan, T., Liu, L., Qin, L., Zeng, F.M., Yuan, B.Y., 2010. Comment on "Mudflat/distal fan and shallow lake sedimentation (upper Vallesian-Turolian) in the Tianshui Basin, Central China: Evidence against the late Miocene eolian loess" by A.M. Alonso-Zarza, Z. Zhao, C.H. Song, J.J. Li, J. Zhang, A. Martín-Pérez, R. Martín-García, X.X. Wang, Y. Zhang and M.H. Zhang [Sedimentary Geology 222 (2009) 42-51]. Sedimentary Geology 230, 86-89. Zhengtang Guo, Bin Sun, Zhongshi Zhang, Shuzhen Peng, Guoqiao Xiao, Junyi Ge, Qingzhen Hao, Yansong Qiao, Meiyan Liang, Jinfeng Liu, Qiuzhen Yin and Jianjing Wei, 2008. A major reorganization of Asian climate by the early Miocene. Climate of the Past 4: 1-22. 宋杨, 郝青振, 葛俊逸, 赵得爱, 张岩, 吴海斌, 徐冰. 黄土高原表土磁化率与气候要素的定量关系研究. 第四纪研究, 2012, 32(4) : 679-689. 肖国桥, 周新郢, 葛俊逸, 詹涛, 姚政权. 西宁盆地晚始新世石膏-红色泥岩旋回的古环境指示. 第四纪研究, 2010, 30: 919-924. 肖国桥, 詹涛, 葛俊逸, 2010. 地磁极性年表的发展回顾. 地球科学进展, 2010, 25: 365-373. 袁宝印，郭正堂，郝青振，彭淑贞，乔彦松，吴海斌，肖国桥，葛俊逸，孙斌，周鑫，尹秋珍，梁美艳，秦利，刘恋，姚政权，刘东生. 2007. 天水－秦安一带中新世黄土堆积区沉积－地貌演化. 第四纪研究, 27(2): 161-171. 尹秋珍, 肖国桥, 郭正堂, 葛俊逸, 郝青振, 袁宝印. 风尘堆积常见的同沉积和沉积后改造特征及其环境意义. 第四纪研究, 2007, 27(2): 295-302. 周鑫, 郭正堂, 彭淑贞, 郝青振, 肖国桥, 葛俊逸, 秦利. 西峰剖面午城黄土古风化强度变化与早更新世季风环境演化. 第四纪研究, 2007, 27(4): 645~650. 葛俊逸，郭正堂，郝青振. 特征时期黄土高原风化成壤强度的空间特征与气候梯度. 第四纪研究. 2006，26(6): 962-968. 解修平, 周杰, 张海龙, 葛俊逸, 郎海鸥, 张宏宾, 2006. 基于景观生态和马尔可夫过程的西安地区土地利用变化分析. 资源科学, 28: 175-181.